length, resistance is lower than what is normally found in entangled polymeric molecules. order to break the nanotube-nanotube ordering. structures to yield an ordered molecular arrangement of some kind with the nanotubes. 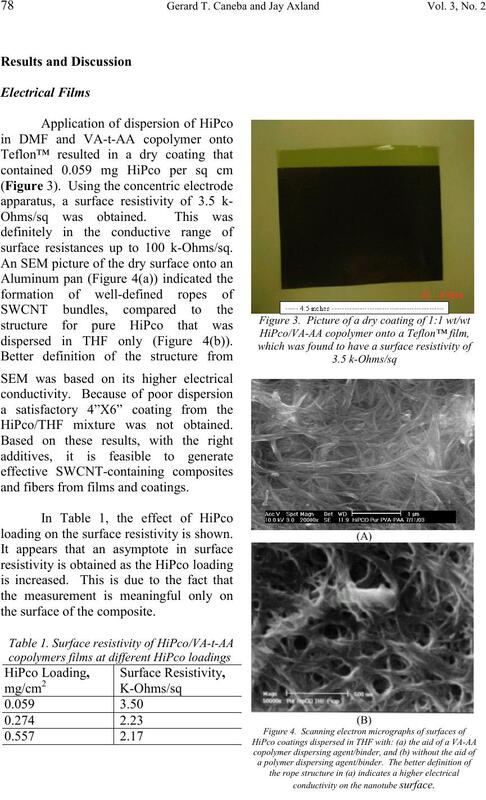 rich nanotube surface. The latter situation happens when Lewis and protic acids are used. groups along the backbone that interact with the carbon nanotubes through π-stacking. With sonication, wrapping of PPV has been declared to occur. more effective surfactant contained phenyl groups in the hydrophobic tail. the opposite side of the bubble impinges onto the surface. 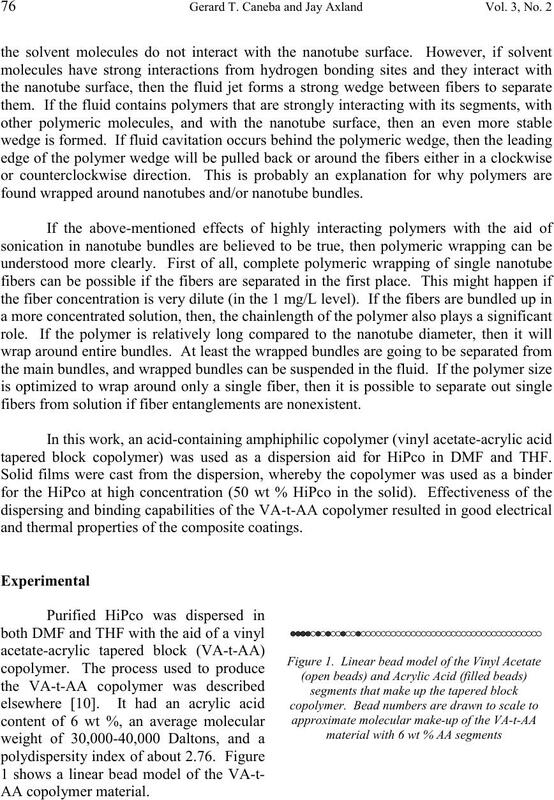 found wrapped around nanotubes and/or nanotube bundles. fibers from solution if fiber entanglements are nonexistent. 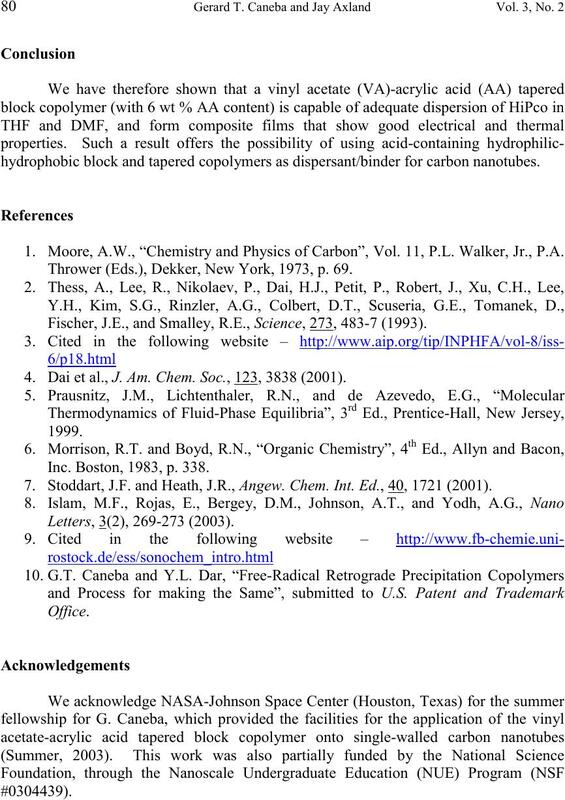 tapered block copolymer) was used as a dispersion aid for HiPco in DMF and THF. 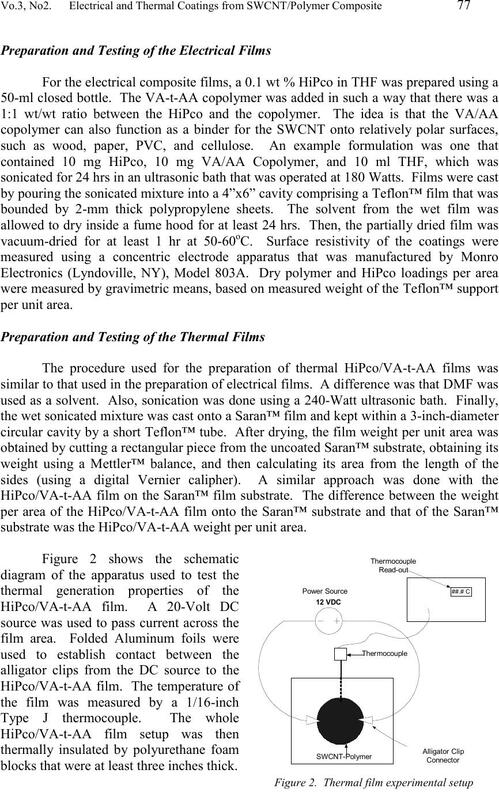 and thermal properties of the composite coatings. substrate was the HiPco/VA-t-AA weight per unit area. blocks that were at least three inches thick. surface resistances up to 100 k-Ohms/sq. dispersed in THF only (Figure 4(b)). HiPco/THF mixture was not obtained. and fibers from films and coatings. loading on the surface resistivity is shown. the surface of the composite. 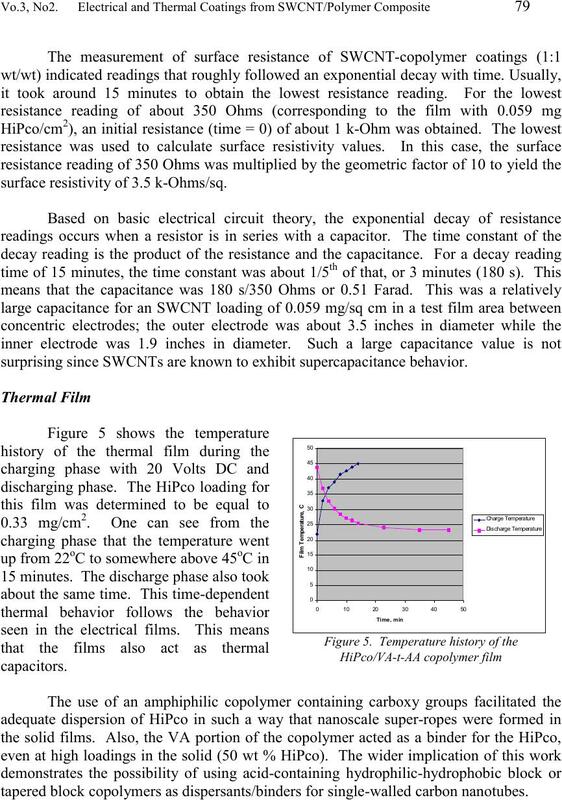 surface resistivity of 3.5 k-Ohms/sq. 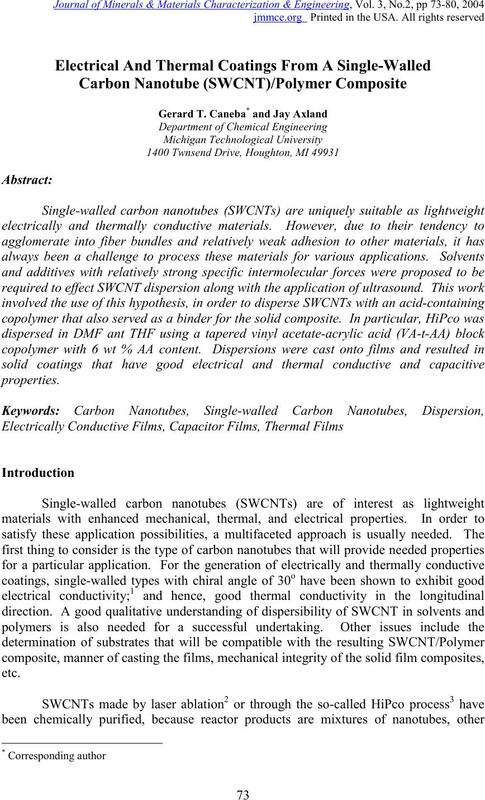 surprising since SWCNTs are known to exhibit supercapacitance behavior. tapered block copolymers as dispersants/binders for single-walled carbon nanotubes. 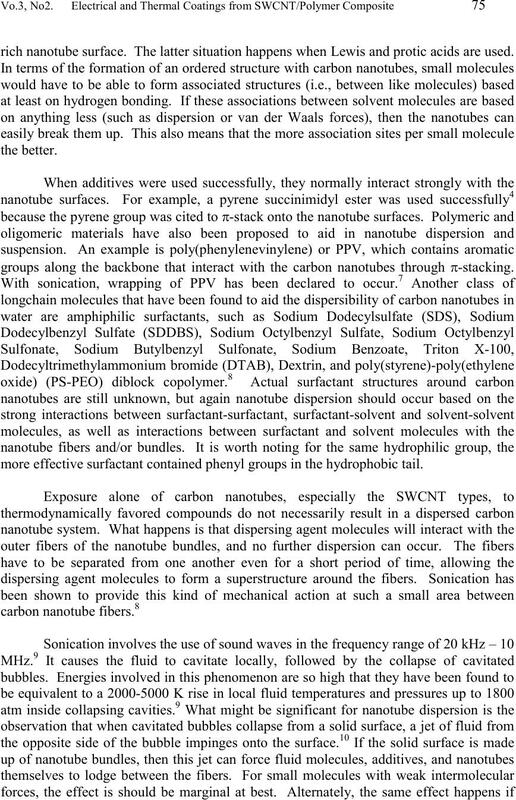 hydrophobic block and tapered copolymers as dispersant/binder for carbon nanotubes. 1. 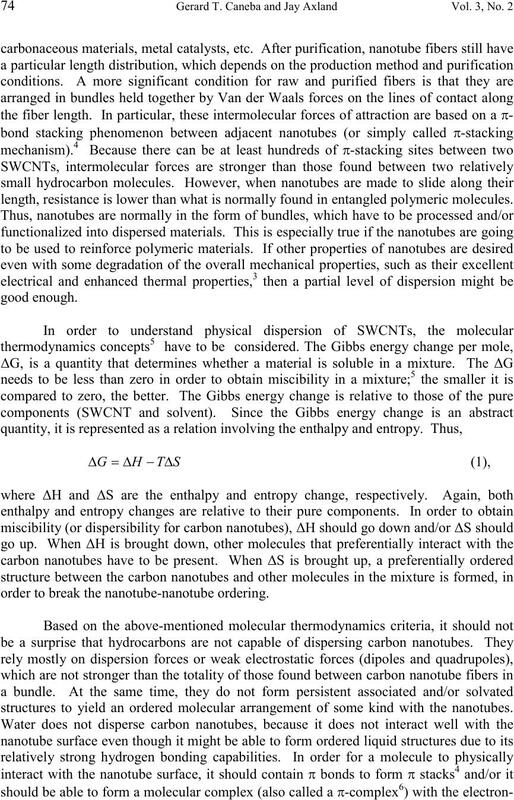 Moore, A.W., “Chemistry and Physics of Carbon”, Vol. 11, P.L. Walker, Jr., P.A. Thrower (Eds. ), Dekker, New York, 1973, p. 69. Fischer, J.E., and Smalley, R.E., Science, 273, 483-7 (1993). 4. Dai et al., J. Am. Chem. Soc., 123, 3838 (2001). Inc. Boston, 1983, p. 338. 7. Stoddart, J.F. and Heath, J.R., Angew. Chem. Int. Ed., 40, 1721 (2001).